Great Fried Chicken Here is Very Common - Comon Korean Cuisine - Shut up and eat. Show me someone who doesn’t like fried chicken, and I’ll show you a damn liar. What’s there not to like? Chicken that’s battered and fried until a golden crisp, RE-BATTERED and then RE-FRIED. Bite after bit of tender pieces of marinated chicken surrounded by ear-drum shattering, impossibly crunchy batter. In some cases, it’s slathered in a sweet and spicy red sauce, or doused in a sweet soy sauce topped with chopped fresh garlic and shredded scallions. Listen, if you don’t like fried chicken – and in this case Korean fried chicken – you basically hate life. 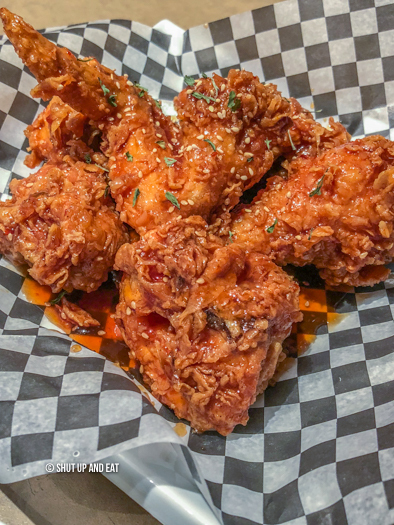 In the past few years, the Korean fried chicken game in Montreal has blown up, with spots like Dawa, Mon Ami, and Hoya to name a few. 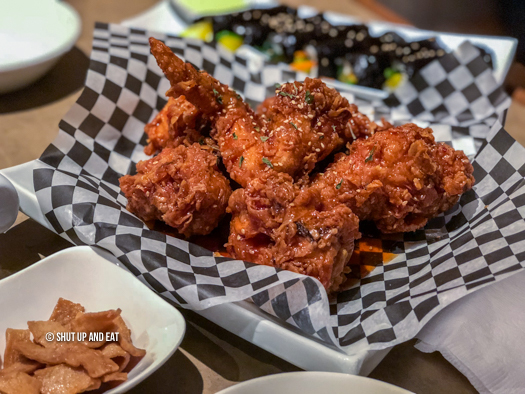 I recently checked out the newest player in the Montreal Korean fried chicken game, Restaurant Comon Korean Cuisine. I first had Korean fried chicken in Montreal about 11 years ago at Chez Hwang (R.I.P) in N.D.G. This family run Korean eatery was known for featuring dishes like bo-ssam (marinated pork hock), homemade soondae gukbap (blood sausage soup) and yangnyeom-chikin – fried chicken. Since then the scene is lit and now you can’t go to any Korean restaurant without seeing their signature fried chicken on the menu, restaurant Comon is no different, common, if you will. We started with the seafood pancake. It was medium at best. 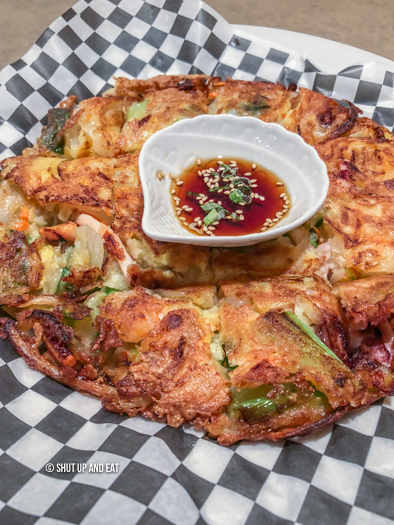 It fills the default seafood pancake void in your Korean meal. Not the best I’ve ever had, but would still eat again. 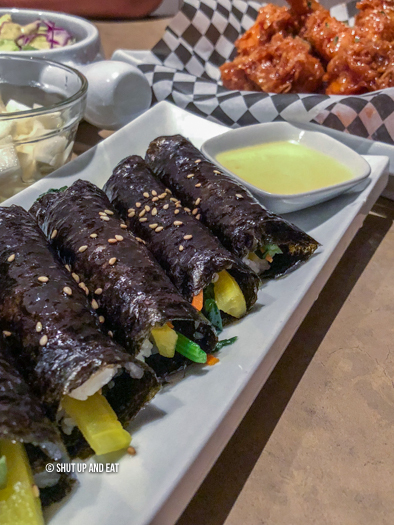 There was a choice between the gimbap – Korean style rice rolls with filling wrapped in nori (basically a Korean style maki roll) and the mini-gimbap. These three-bite gimbap poppers were delicious and fun to eat; served with a side of tangy mayo. Their menu spotlights the five different kinds of fried chicken that they offer – original recipe, seasoned sweet chicken, seasoned “very spicy” chicken, soysauce and garlic chicken, and chicken with green onion. I used to be a big believer in always ordering the O.G. chicken first because you want to get a good baseline before exploring other options. But I figured, the seasoning of the chicken would probably be overshadowed by the sauce anyways, so if the sauce is good, it’s all good with em. Extra points. The sauce was good. Great, in fact! The sauce was perfectly sweet and mildly spicy with a slight tang. The fry on the chicken was ridiculous. It was light and but provided enough crunch that you want in a battered fried chicken and stayed crunch until the end of the meal despite being slathered in a thick sauce. Double extra points. One of the best damned picked of Korean fried chicken I’ve had in a while. The banchan (side dishes) were scarce – small plate of kimchi and Odaeng (marinated shredded fish cake). As much as I love a variety of side dishes with my Korean food, It wasn’t the end of the world for me. Restaurant Comon Korean Cuisine is definitely a find. I was impressed with the chicken and friendly service. Despite the nightmare traffic trying to get to Verdun from all the way Uptown, I would gladly make the trip and multiple detours to cop that chicken again. Love life, eat fried chicken.